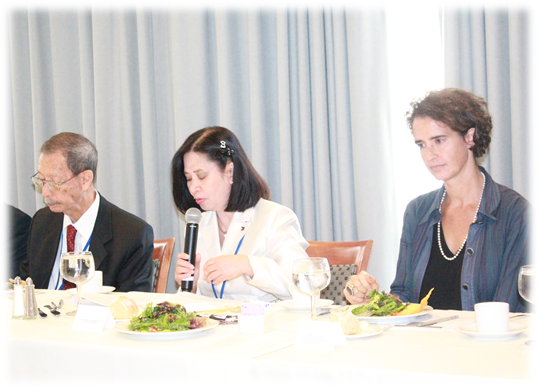 NEW YORK, 10 June 2015 – “The South China Sea is already in an environmental crisis,” Ambassador Lourdes O. Yparraguirre, Philippine Permanent Representative to the United Nations, told about a hundred UN legal experts in a forum organized by the Philippines that focused on the protection and preservation of the marine environment. With the theme, “UNCLOS and the Protection of the Marie Environment”, the event was held at the sidelines of the week-long 25th Meeting of States Parties to the United Nations Convention on the Law of the Sea (SPLOS) at the UN Headquarters. “Today, the Philippines would like to bring focus on one of the most important parts of UNCLOS. As States Parties, we share the duty to protect and preserve the marine environment under Part XII, We also – and this extends to non-States Parties too – need to cooperate on a global and regional basis in formulating rules and standards and adopt measures in order to carry out this duty,” Ambassador Yparraguirre said. The Philippines is a State Party to UNCLOS which defines the rights and responsibilities of nations with respect to their use of the world's oceans, establishing guidelines for businesses, the environment, and the management of marine natural resources. Part XII of UNCLOS deals with the protection and preservation of the marine environment. The forum featured two experts, namely: Dr. Edgardo Gomez, professor emeritus of the University of the Philippines Marine Science Institute and National Scientist of the Philippines; and Ms. Youna Lyons, senior research fellow in the Ocean and Policy Programme of the Centre for International Law of the National University of Singapore. Assistant Secretary Benito Valeriano of the Maritime and Ocean Affairs Office and Assistant Secretary Eduardo Jose de Vega of the Office of Legal Affairs also joined the panel. In his presentation, Dr. Gomez discussed the effects of the massive, large-scale ocean filling, or what the media refers to as the “reclamation” that China has undertaken with great acceleration since the Philippines filed an arbitral case against it under UNCLOS in 2013. Some of the features where this has taken place include Johnson Reef, McKennan Reef, Mischief Reef, Cuarteron Reef, Gaven Reef and Fiery Cross Reef. Dr. Gomez applied calculations of ecological economics to estimate that the 800 hectares of ocean filling or reclamation done by China, by destroying centuries old coral reef ecosystems used as land fill, amounted to a loss worth US$280 million in ecosystem products and services. He further said that the exploitation of endangered species must be stopped, as well as the overfishing and destructive fishing, while extractive activities must be sustainable and no ecosystems must be further destroyed or compromised. For her part, Ms. Lyons called for a pragmatic approach in the West Philippine Sea which would include a moratorium to further development and dredging of new features in order to save what can be saved. She also proposed the creation of a peace park, as suggested by marine science experts on the South China Sea, focusing on a representative network of shallow features on the Spratly seamounts.